Weird Catches: Moray Eels, Sea Turtles, and Pelicans, Oh My! Every now and again you come across a new gizmo or doo-dad that makes the world of boating better. And if that item just so happens to make your life easier at the same time, it’s a real win-win. Such is the case with Eagle 1 Wax-As-U-Dry. Sure it’s made for cars, but this stuff is great for boaters, too. Eagle 1 makes car care products, but for many years they’ve been sending me samples of new cleaners and waxes as they come out. Quite often, those products marketed to the (much bigger, more lucrative) automotive market are quite appropriate for fiberglass. 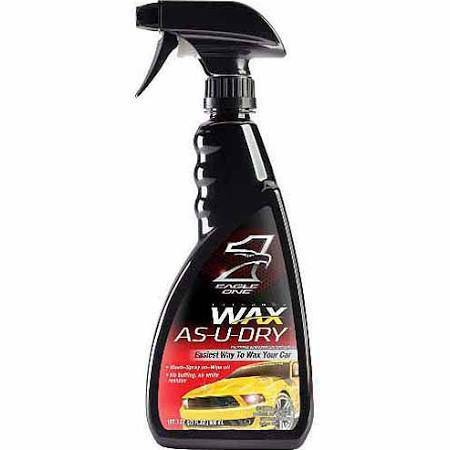 Wax-As-U-Dry falls into this category, and it has one big perk that makes it great for boaters: it can be applied to both wet and dry surfaces. Usually, if you want to get a coat of wax on your boat you’ll first need to shammy it dry. This stuff makes it possible to skip that step. You spray it on, wipe it down, save time, and your boat gets a shiny gloss. Now, this stuff isn’t some kind of magical coating that’s going to eliminate the need to coat your boat thoroughly with paste wax. You’ll still need to give your ride a good base coat at the beginning of the season, and every month or so thereafter. But it does take the place of the mid-month carnauba wax job that may not be as protective as paste wax, but gives your gel coat a delicious gleaming shine. Price is $7.00 for a bottle, and you can find out more at Eagle One.